Too cute! The White Rabbit from Alice in Wonderland! Yes, that is a pocket watch he's holding. And in a suit jacket, shirt, vest and bow tie (and an umbrella under his arm). The line-up! 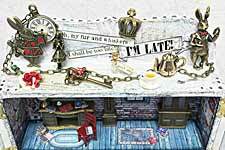 I thought it would be useful to see the relative sizes of these 3D Alice in Wonderland charms. 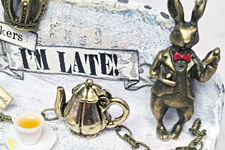 From left to right: Bronze 3D Rabbit with Cards, Bronze 3D Alice in Wonderland Herald Rabbit, 3D Bronze Alice in Wonderland Charm, Antique Bronze 3D Rabbit Charm.